Sister Sarah Naughton, O.P. (Chad) was born July 24, 1946 in Sioux Falls, South Dakota. Her father, Ed was a milkman, and her mother, Nellie, was a full time homemaker. Nellie taught her children to read before they went to school, was a Cub Scout den mother, and was very involved with parish and Catholic organizations in the city. Sister Sarah attended parish schools and graduated from O’Gorman High School in 1964. After graduation she entered the Congregation of the Most Holy Rosary and made her religious profession as a Dominican Sister of Sinsinawa in 1966. Sister Sarah graduated with a B.A. from Rosary College (1968), an M.A. in Non-Public School Administration in 1980 from the University of St. Thomas in St. Paul Minnesota, and a Doctorate in Educational Leadership, from the University of St. Thomas, in 1999. Sister Sarah had a career in secondary school teaching and administration in River Forest, Illinois and Dallas, Texas. She held administrative positions with the Dominican Sisters for fourteen years. 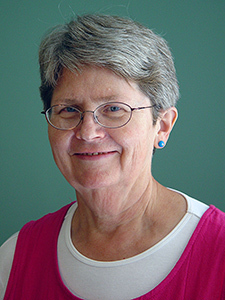 She has held several positions at Edgewood College, currently serving as the College Archivist.